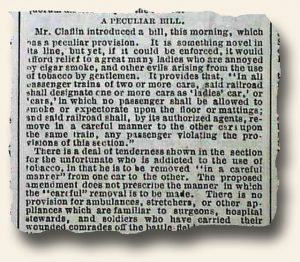 I traveled to Boston today by the way of the Independent Chronicle dated October 14, 1816. 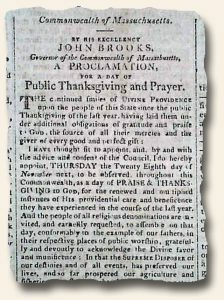 I found “By His Excellency John Brooks, Governor of the Commonwealth of Massachusetts, A Proclamation, for a day of Public Thanksgiving and Prayer.” had been proclaimed. This was to be held on the Thursday, November 28. While the most significant feature of the “St. Louis Daily Globe” of February 2, 1875 is a report regarding Frank and Jesse James, the front page has a curious report headed: “A Peculiar Bill” concerning the need to create nonsmoking cars which would: “…afford relief to a great many ladies who are annoyed by cigar smoke, and other evils arising from the use of tobacco by gentlemen…” (see image). The history of the origin of the name of the “Baby Ruth” candy bar by the Curtis Candy Company is interesting, brought to light recently with our finding the “Frank Leslie’s Illustrated” issue of Jan. 5, 1893. 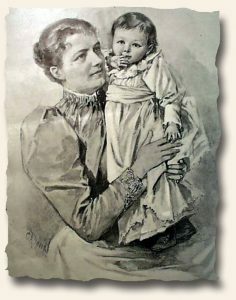 The full front page is an illustration captioned: “Baby Ruth and Her Mother” being the child of President Grover Cleveland. This is the person for whom the “Baby Ruth” candy bar was named, not Babe Ruth the famous baseball star as was popularly though. And the story behind the name is interesting. In Chicago in 1921 Otto Schnering had a turnaround plan for his Curtis Candy Company. He reformulated his “Kandy Kake” brand confection—a conglomeration of milk chocolate, peanuts and a pudding center “richer than marshmallow, fluffier than nougat, better than either of them”—into a chocolate-covered candy bar with peanuts, caramel and nougat. Along with the new recipe came a new name—Baby Ruth. At first glance, it seemed clear that Schnering had taken advantage of the home run king’s well-known name and tweaked it by one letter in order to avoid paying the “Sultan of Swat” any royalties. Perhaps because of its perceived connection to the Yankee slugger, Baby Ruth was a big success. By 1926, sales of the candy bar totaled $1 million a month, and the company’s candy-making facilities were the largest of their kind in the world. Given the above, it is curious that this image of Baby Ruth Cleveland appeared on the front page of this very popular illustrated newspaper. Perhaps it is the only image of her in a newspaper. In celebration of its 20oth anniversary the American Antiquarian Society published a beautiful exhibition catalog titled “In Pursuit Of A Vision – Two Centuries of Collecting at the American Antiquarian Society”. Featured are a fascinating array of books, documents, maps & other paper ephemera, as well as several very rare & unusual newspapers we felt worthy of sharing with our collectors (with permission from the A.A.S.). In recent years AAS has actively collected issues of pre-1877 American manuscript periodicals. These handwritten examples mimic printed periodicals in format and content, containing stories, news, and advertisements. 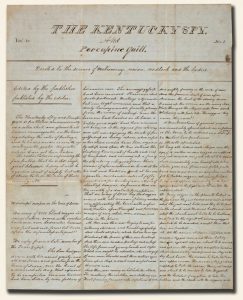 Sometimes they were produced by individuals, serving as the manuscript equivalent of amateur newspapers, and sometimes they were issued by small groups. Others were produced as an activity of a school or lyceum. AAS has held manuscript periodicals since the nineteenth century; but because these were long shelved alongside printed periodicals, they were easily overlooked. In the 1990s AAS staff began to pull them together into a separate collection, in the process discovering not only how many titles were already at AAS, but also the frequency with which they were produced. As it became apparent that the more specimens AAS had, the more they collectively revealed about early American scribal culture, AAS began to seek them actively. The collection now numbers more than sixty titles. One of the more unusual is “The Kentucky Spy and Porcupine Quill.” The masthead claims that it is “Devoted to the science of matrimony, union, wedlock and the ladies.” However, the chief story, entitled “Wonderful rumpus in the town of Irvine,” is a fictional account, humorous in tone, of a revolt by 5,000 heavily armed slaves which in the story turns out to be a hoax. The editor and contributor(s) are unnamed. 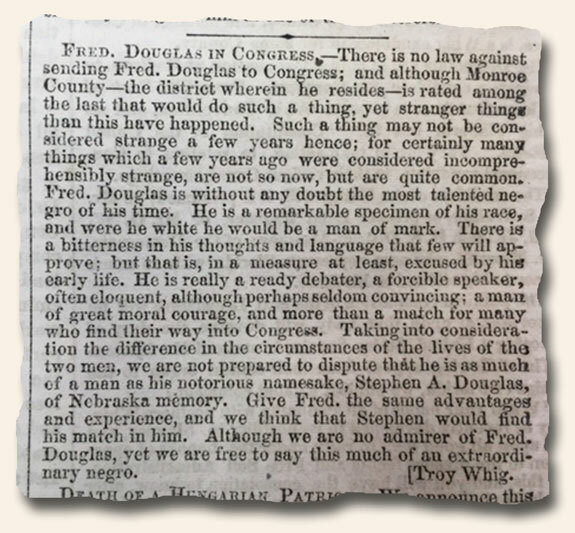 Today I traveled back to New York City by the means of the New York Evening Post dated July 2, 1816. 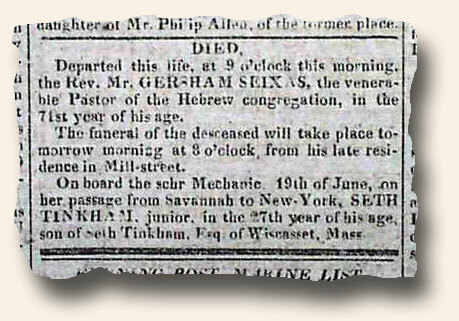 Under the “Died” column is “Departed this life, at 9 o’clock this morning, the Rev. Mr. GERSHOM SEIXAS, the venerable Pastor of the Hebrew congregation, in the 71st year of his age…”. Mr. Seixas was the first Native-born American rabbi. He also delivered the first Thanksgiving address in an American synagogue after the adoption of the United States Constitution. He was one of the fourteen ministers to participate in George Washington’s first inauguration. At the merger of the 200th anniversary of his death and the 240th anniversary of the American Declaration of Independence it is fitting to consider how quickly the Jewish population became acclimated and accepted in the United States. While not without considerable bumps in the road, George Washington’s outspoken support for Jewish citizens was certainly a good beginning. Question: Washington’s letter to the Hebrew Congregation in Newport, RI received a response from Rabbi Moses Seixas. If anyone can confirm whether or not Moses and Gershom were related, please contact Guy at guy@rarenewspapers.com. Perhaps not a perfect system, but… Happy Memorial Day! Is the United States perfect? Certainly not. Our forefathers did not sacrifice time, security, and in many cases, life or limb for the sake of a perfect system of government. Their hope was to establish a government for the people – which would provide the opportunity for all to pursue happiness in an environment free of governmental oppression and steeped with a host of inalienable rights. For some, “all” meant everyone. To others, “all” was defined quite narrowly. Still, even those who had a broader view understood the benefit of compromise – for the purpose of establishing a system which would have enough flexibility to adjust to their broader view of “all” over time. We know now the great advancement in this regards only came through a Civil War; however, it came. A perfect system? No. The best system ever constructed by man? Absolutely. It is always interesting to read criticisms of political decisions of centuries ago with the luxury of hindsight. 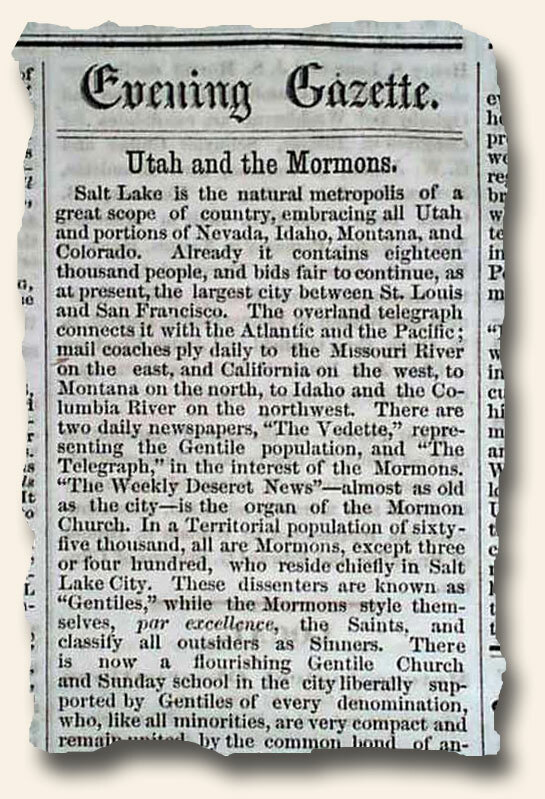 Early newspapers allow today’s reader to recognize just how much thought was not just wrong, but laughably wrong. From that purchase in 1803 would be carved fifteen future states as well as two Canadian provinces. Its value to the United States would be incalculable today, and in fact was considered an incredible bargain many years before the Civil War. 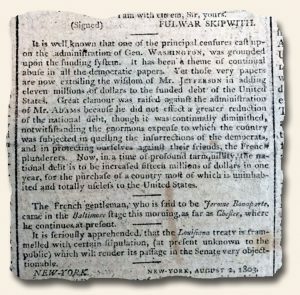 Today I journeyed to New York City by the way of the New-York Spectator of May 15, 1816. 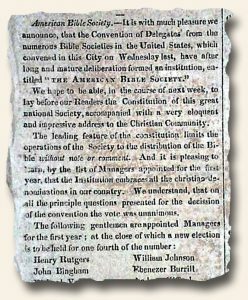 There I found the announcement of the formation of “The American Bible Society” which still exist today. Some of the founding/early members include Elias Boudinot, who had been President of the Continental Congress from 1782 to 1783, John Jay, the first Chief Justice of the U.S. Supreme Court, Frederick Theodore Frelinghuysen, Daniel Coit Gilman, Edwin Francis Hyde, and Francis Scott Key. The front page report announced the formation of the organization and the third page report contained their resolutions. “… The leading feature of the constitution limits the operations… to the distribution of the bible without note or comment…”. Also in the issue is an article “Bank of the United States” in which “The President and Senate have appointed the following named, Directors of the Bank of the United States… John Jacob Astor, of the city of New-York…”. Mr. Astor was known as the first prominent member of the Astor family, the first multi-millionaire in the United States and the fifth-richest man in American history. 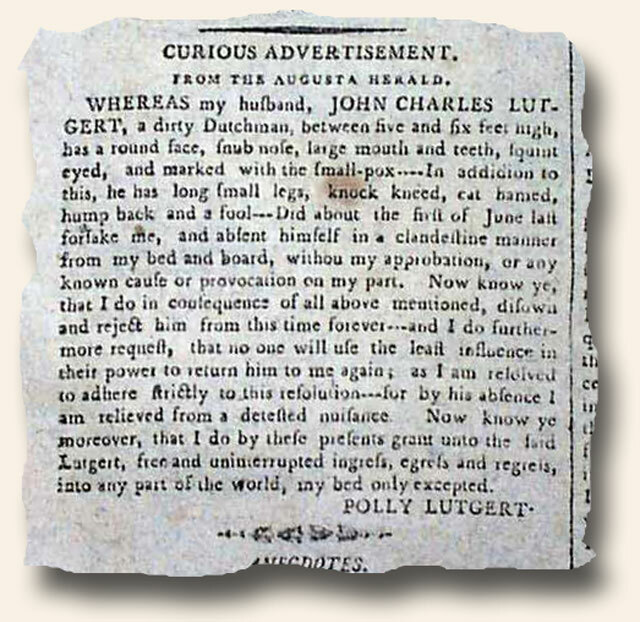 The “Weekly Museum” newspaper of New York City has in its August 30, 1800 issue, a: “Curious Advertisement” by a woman whose husband left her. 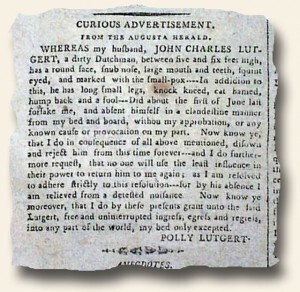 She pulls no punches on how she feels: “Whereas my husband…a dirty Dutchman…did…absent himself in a clandestine manner from my bed & board without my approbation or any known cause of provocation on my part…I do…disown and reject him from this time forever…no one will use the last influence…to return him to me again as I am relieved from a detested nuisance…” with more (see). I don’t think there was much hope that marriage would be saved.